The tranquil town is a step back in time (photo: Edwina Hart). Deep in the Morocco’s Rif Mountains is a blue city with labyrinth-like streets that is nothing like you’ve seen before. 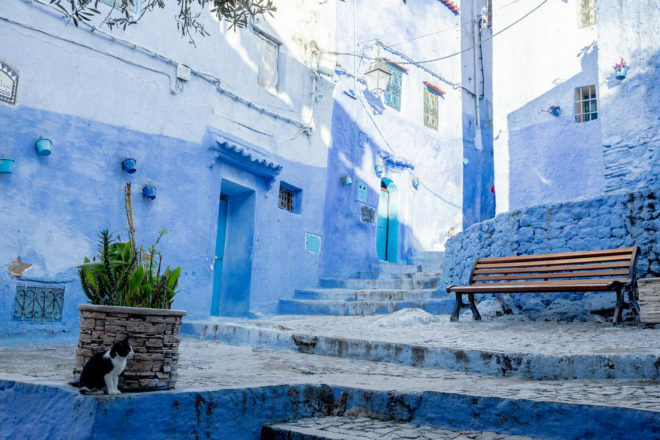 Here are 6 things you should do when you reach magical Chefchaouen, writes Edwina Hart. Embrace the stunning Talassemtane National Park; one popular walking trail begins at the village of Akchour, a 40-minute drive from Chefchaouen. The four-hour round-trip hike to the waterfall promises scenic views, beds of wildflowers, a natural structure known as God’s Bridge, and crystal-clear pools to take a dip. Try the local speciality, melt-in-your-mouth lamb tagine studded with almonds and sweetened with plump prunes, slow-cooked in a traditional earthenware pot. Wood-fired flatbread is a staple with most meals, perfect for mopping up tasty soups, warm salads and tagines. Chaouen is also known for its wonderful produce; goat’s cheese is a must-try, as are dried figs, olive oil and strawberry tree honey. The main cobblestoned square is lined by mulberry trees, craft shops, sidewalk cafes and the 15th-century Grande Mosque, with its unusual octagonal minaret. There’s also a well-preserved kasbah; the ochre-tinged fortress is now home to a pretty garden and the Ethnographic Museum. A climb to the kasbah’s top will reward you with lovely views. Dive into the vibrant bazaar where easygoing vendors sell argon oil, aromatic spices, amber and musk. Shops are crammed floor to ceiling with trinkets, antiques and shabby-chic pottery, and you can barter over Berber carpets, woollen garments and woven Rifi blankets unique to the region. The area is known for leatherwork; ensure you order a pair of babouche slippers to be made while you’re in town. A Moroccan spa experience is the perfect way to unwind. There are public baths for locals, but if it’s your first time you may prefer to try an option tailored for visitors. Lina Ryad & Spa has a traditional Hamman with scrubbing and soaping using rhassoul (natural clay), followed by a massage using sweet almond oil. If you only do one thing in the Blue City, make it the short hike up to the Spanish Mosque to take in the sweeping sunset views. Don’t start your descent until you’ve heard the soul-stirring symphony of the call to prayer ringing out from the surrounding mosques.